We've got a nightly routine. After dinner and homework it's Netflix time. My husband and I claim the living room and kick the kids to their game room/den. Although my French Doors and DIY Transom window majorly improved the outside view of the game room, the inside has been pretty much ignored. It contains some hand-me-down furniture, a tube TV, and an inexpensive futon couch. 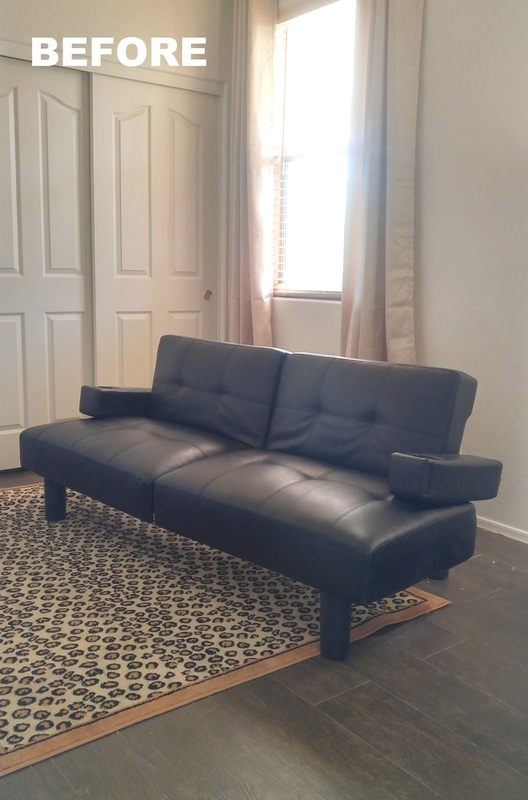 I cringed every time I walked past the dang faux leather futon. It looks alright, but the original plastic legs are basically PVC pipe and the seat height was awkwardly low. We don't have a guest room, so we really need the ability to make an extra bed from time to time. 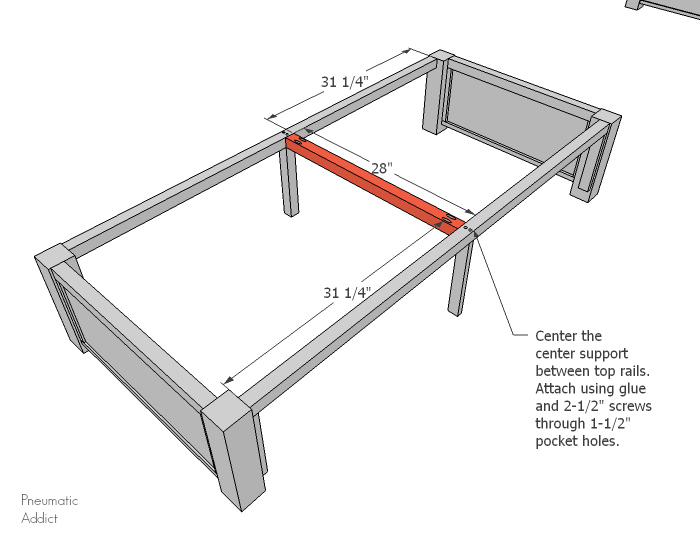 I decided instead of coughing up hundreds of dollars for a new hide-a-bed, I decided to build a cool, custom futon base. And while I'm at it, I might as well add some much needed storage. 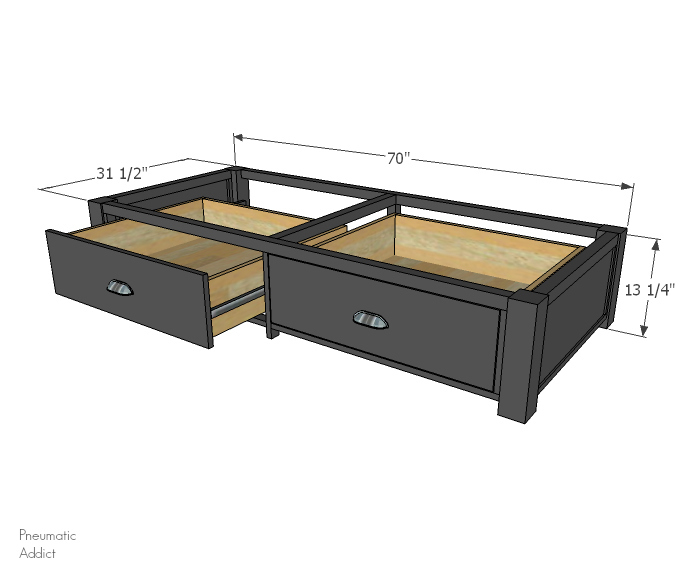 I provided the measurements for my specific couch and base, but this design could be modified to fit many different styles of futon. 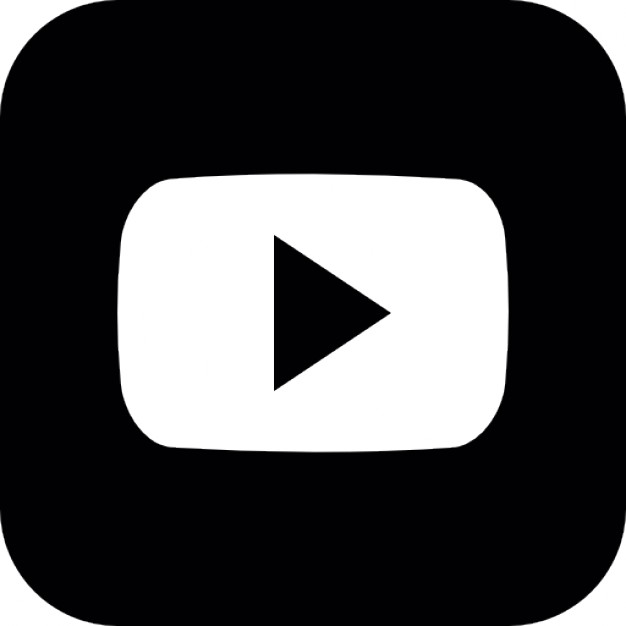 Just adjust the width or depth to fit your needs. (3) 2 x 2 x 96"
(4) 1 x 2 x 96"
(1) 1 x 10 x 72"
(2) 1 x 8 x 96"
(4) 3 x 3 posts @ 13-1/4"
(2) 2 x 2 @ 25-1/2"
(2) 2 x 2 @ 64"
(1) 2 x 2 @ 11-3/4"
(1) 2 x 2 @ 28"
(7) 1 x 2 @ 9-1/2"
(2) 1 x 2 @ 25-1/2"
(1) 1 x 2 @ 11-3/4"
(2) 1 x 2 @ 31-5/8"
(2) 1 x 2 @ 31-1/4"
(3) 1 x 2 @ 28"
(2) 3/4" plywood @ 9-1/2" x 24"
(4) 1 x 8 @ 28"
(4) 1 x 8 @ approximately 28-1/4"
(2) 1 x 10 @ 30-5/8"
1. 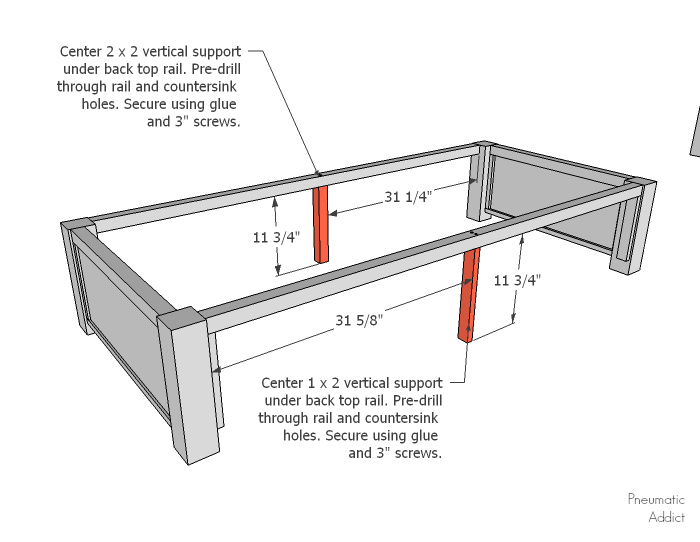 You can cut each component before you start assembling, with exception to the drawer pieces. 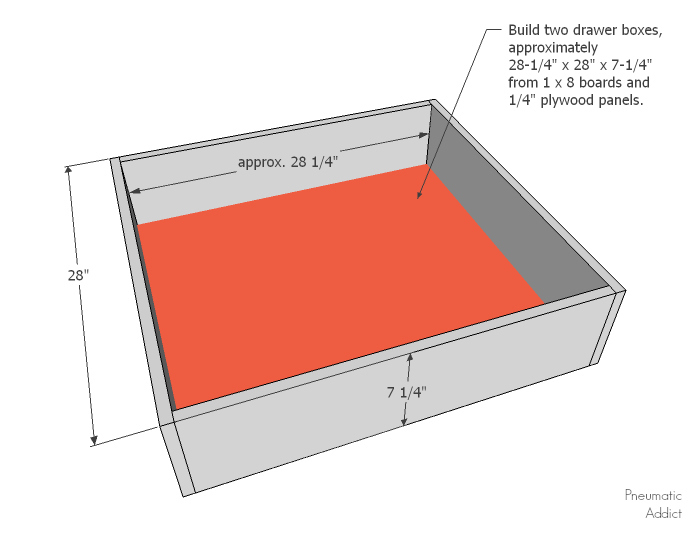 Whenever building anything with drawers, you want to wait and take exact measurements before building drawer boxes, TRUST ME! 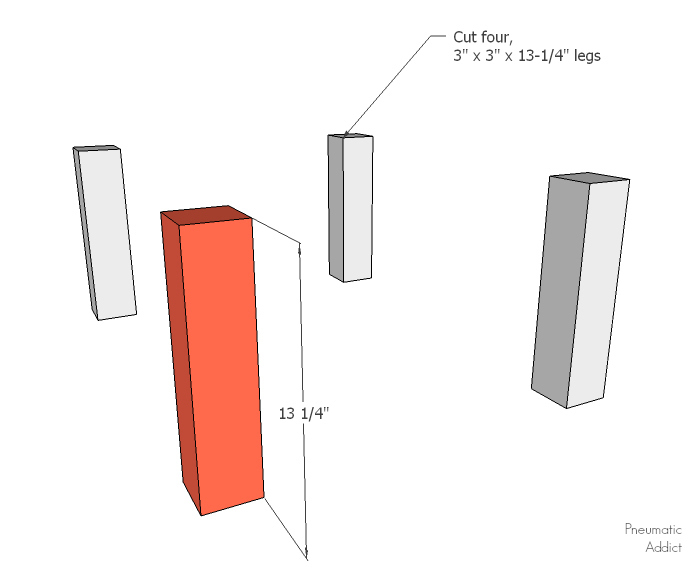 The first step is to cut the 3 x 3 posts or table legs to 13-1/4" lengths. 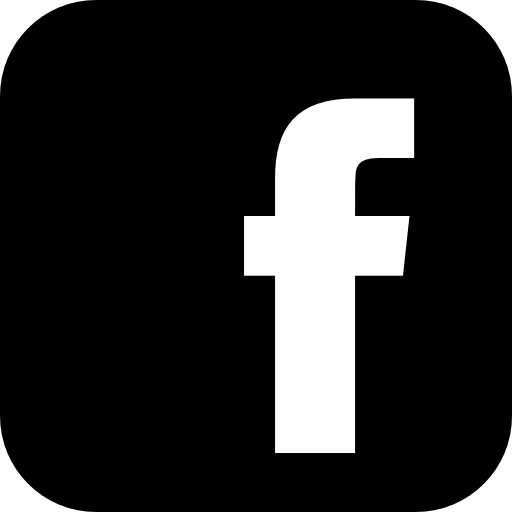 You can find straight table legs on a website like Osborne Wood, or some local big box stores will carry them. 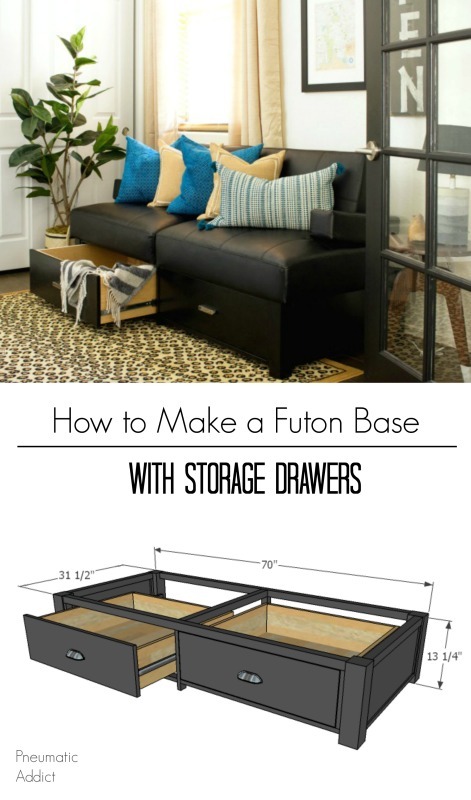 If you intend to paint the futon base like I did, the species of wood doesn't matter. 2. Next, start pairing legs together. Attach end top rails between legs. 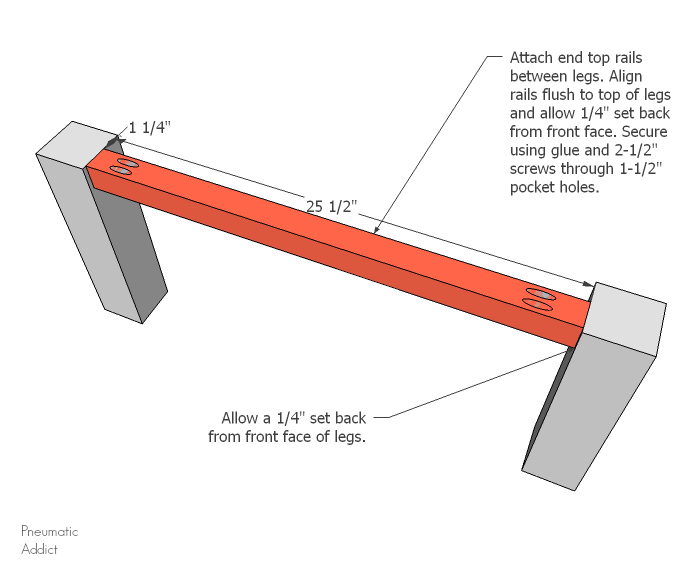 Align the rails flush to top of the legs and allow 1/4" set back from front face. This is referred to as a "reveal". 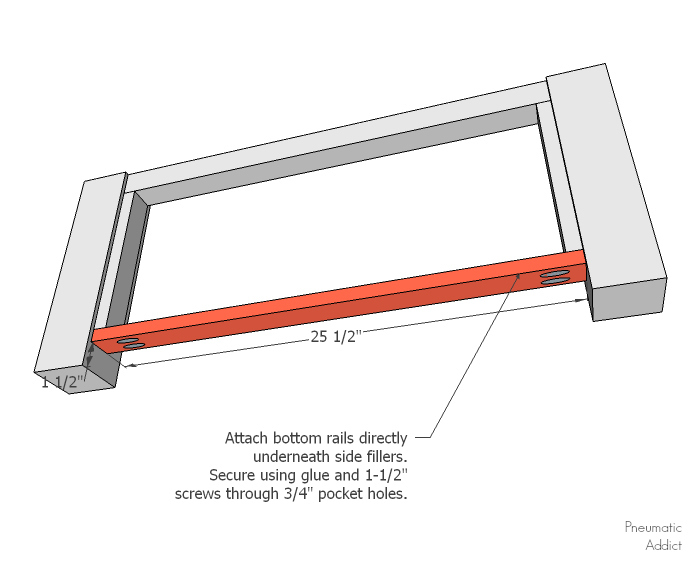 Secure in place using glue and 2-1/2" screws through 1-1/2" pocket holes. 3. Place 1 x 2 x 9-1/2" side fillers beneath end top rails. Allow 1/4" set back from front face of legs. Attach using glue and 1/4" brads. 4. Attach bottom rails directly underneath side fillers. Secure in place using wood glue and 1-1/2" screws through 3/4" pocket holes. 5. 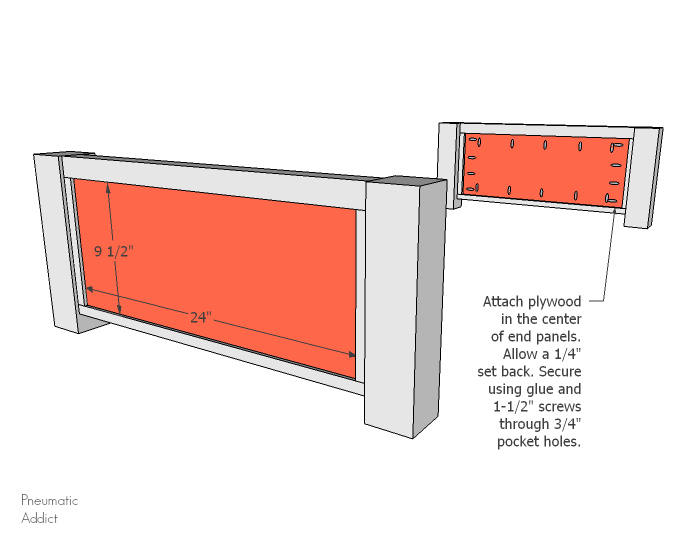 Attach plywood in the center of the end panels. Allow a 1/4" set back. Secure using glue and 1-1/2" screws through 3/4"pocket holes. 6. Attach top rails flush to the top of legs. Allow 1/4" set back from the outside faces. Secure using glue and 2-1/2" screws through 1-1/2" pocket holes. 7. Align front filler pieces beneath the front top rail. Allow 1/4" set back from front face of legs. Secure using glue and 1-1/4" brads. 8. Center a 1 x 2 vertical support under the back top rail. Pre-drill through the rail and countersink the tops of the holes. Secure using glue and 3" screws. Center a 2 x 2 vertical support under the back top rail. Pre-drill through the rail and countersink the tops of the holes. Secure using glue and 3" screws. 9. Center the center support between top rails. Attach using glue and 2-1/2" screws through 1-1/2" pocket holes. 10. 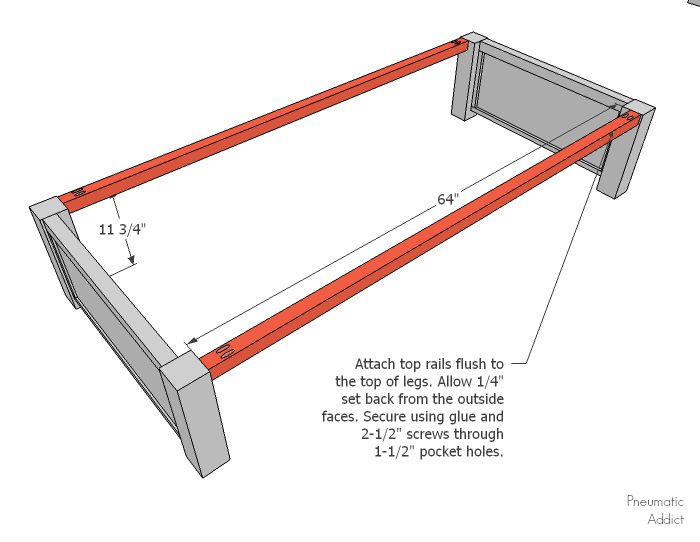 Attach 31-5/8" rails between the front legs and front vertical support. 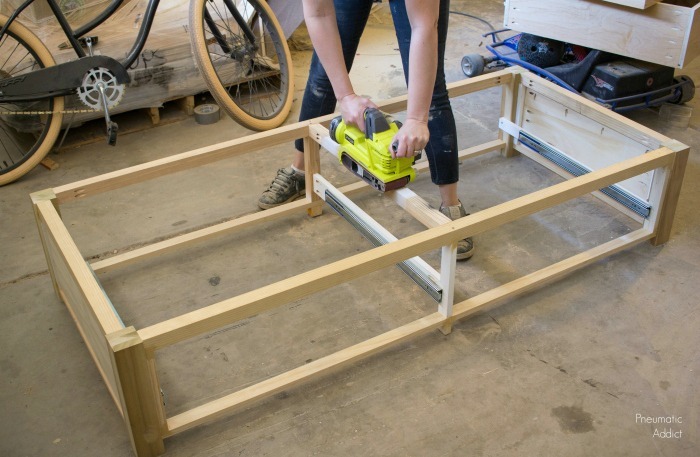 Allow 1-1/2" spacing from the ground, or bottom end of the legs. Secure using glue and 1-1/4" screws through 3/4" pocket holes. Attach 31-1/4" rails between the back legs and back vertical support. Allow 1-1/2" spacing from the ground. Secure using glue and 1-1/4" screws through 3/4" pocket holes. 11. 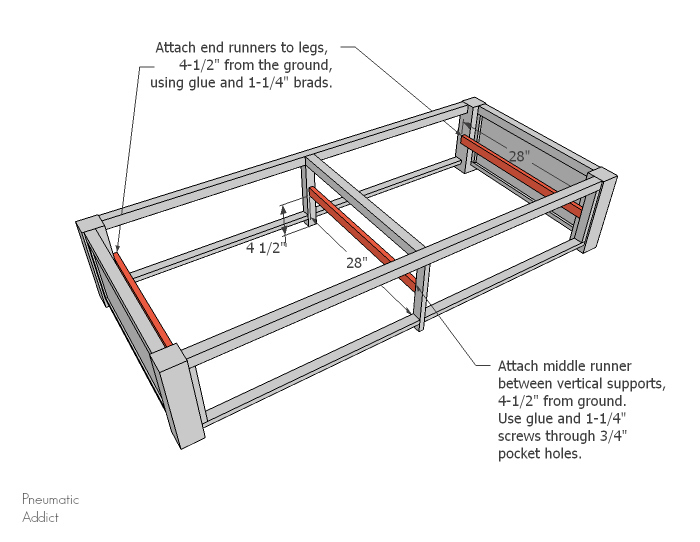 You need something to attach the drawer slides to, a strip of wood I called a "runner". 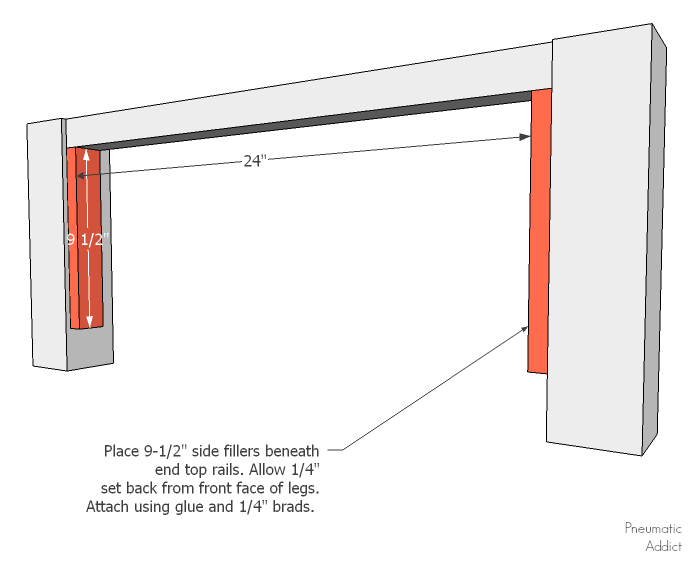 Attach the two end runners connecting the front to the back, 4-1/2" from the ground, using glue and 1-1/4" brads. 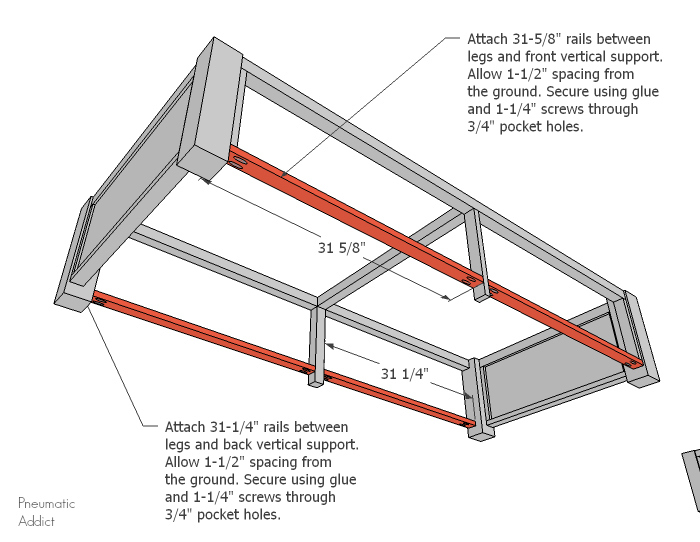 Attach middle runner between vertical supports, 4-1/2" from ground. Use glue and 1-1/4" screws through 3/4" pocket holes. 12. Now is the time to measure for your drawers. The depth of the boxes shouldn't change, but there can be slight variations in your wood and the exact width of the openings can change. 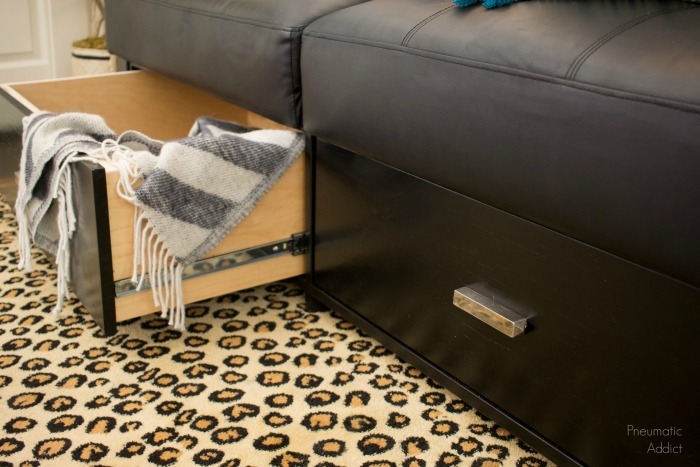 Drawer slides can be finicky and if your boxes aren't the perfect width, your drawers won't function properly. 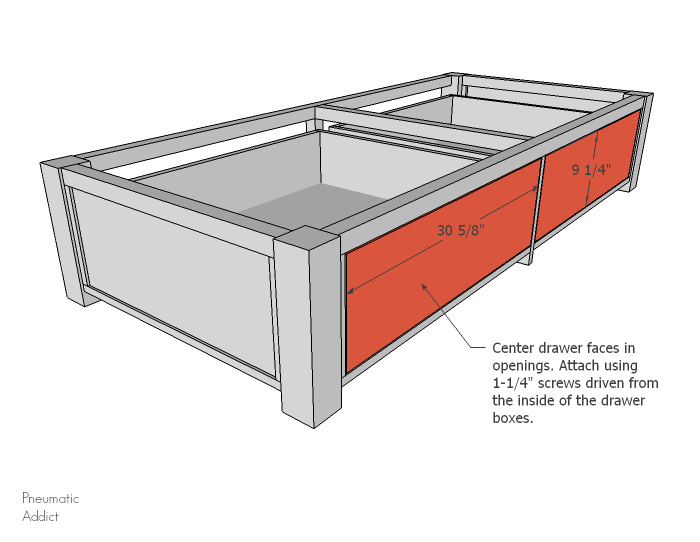 I could write a whole blog post just about building the drawer boxes! I built mine similar to this style, but if you are a beginner, my favorite tutorial is this one by Build Basic (and not just because Jenn is one of the coolest chicks I know). 13. 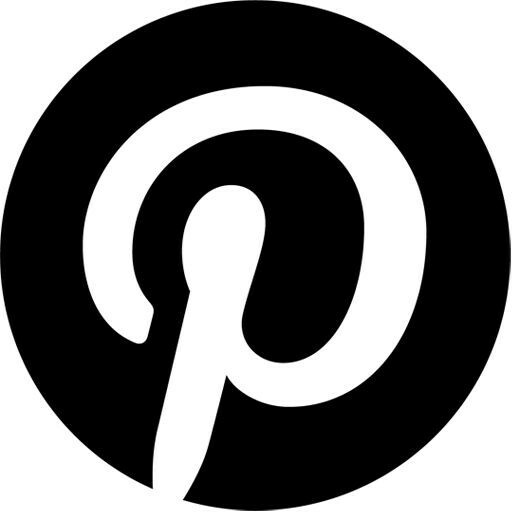 This is the point when you want to sand and finish your futon base. When I start to transform cheap pine boards into furniture, they usually take a little love. A good belt sander is a must. 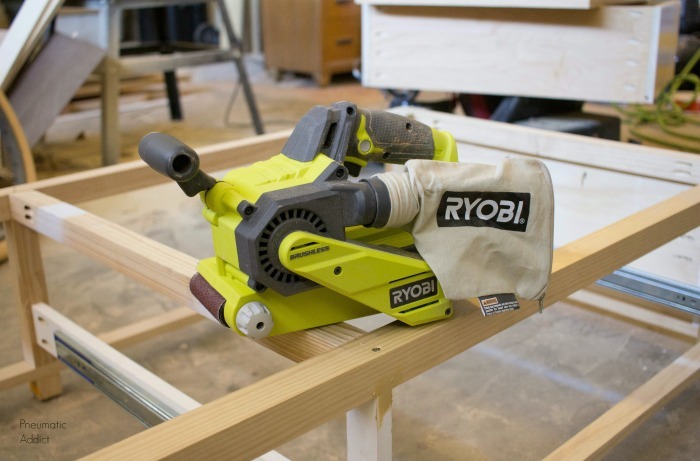 I tried out the new Ryobi Cordless Belt Sander on this bad boy and it was freaking great! It was so nice to not have to fight an annoying cord while I sanded all the weird angles. After the belt sanding, I switched to an orbital sander and worked my way up the grits, finishing with a 220-grit. Then, the frame and both drawer faces received 3 coats of durable black enamel paint. 14. Once your sure your finish is nice and dry, you can add the drawers. 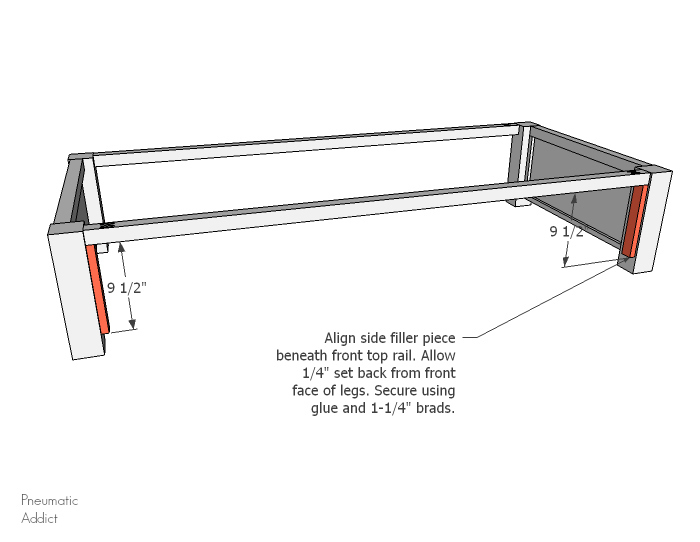 Following the instructions on the package, Attach 24" metal drawer slides to runners. 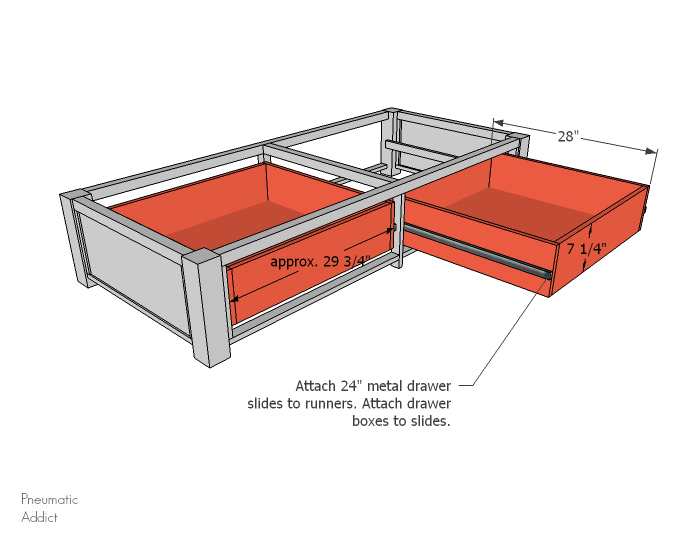 Attach drawer boxes to slides. 15. Center drawer faces in openings. 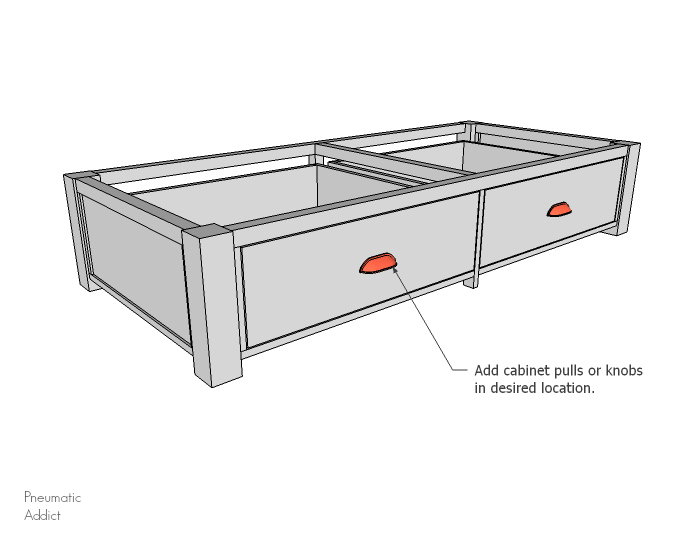 Attach using 1-1/4" screws driven from the inside of the drawer boxes. 16. You can add whatever hardware you'd like. I dug up some vintage cup pulls that I'm madly in love with. 17. The last step is to unscrew the cheap plastic legs, carefully lower the futon onto your new base and then you're in business! My futon sub-frame had open spaces where I could drive screws into the base. 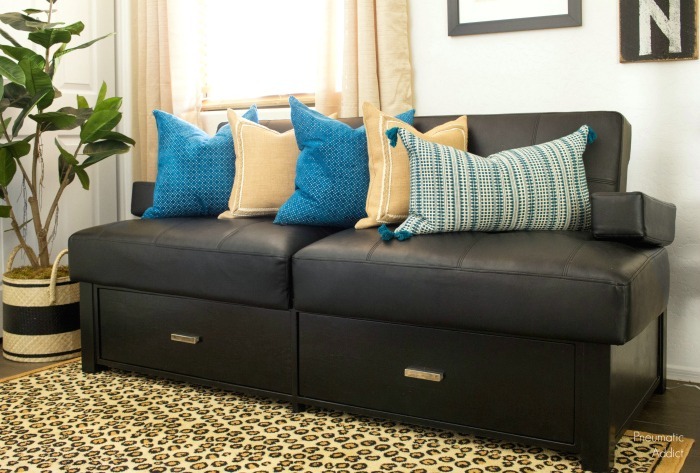 You'll have to take a look at the underside of your couch to see where you can create a mounting point. I have pretty blankets staged in the drawers right now, but seeing how this futon resides in my boys' game room, I'm sure they will be stuffed with Legos and crushed Goldfish in no time. I'm really glad I spent the extra money for the full extension drawer slides! Being able to access all that storage space is so handy! I had originally planned to build a stained wood base for my crappy little futon, but I think matching the black color helps the base look original and will definitely help hide grimy fingerprints. I'm in love. I've got 8 more of these sweet vintage drawer pulls, so don't worry, they'll make an appearance on more furniture I'm sure. 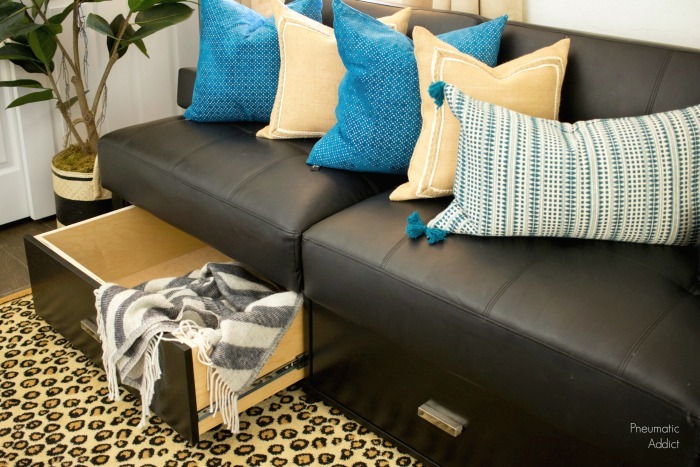 Are you ready to give your simple futon a major upgrade? 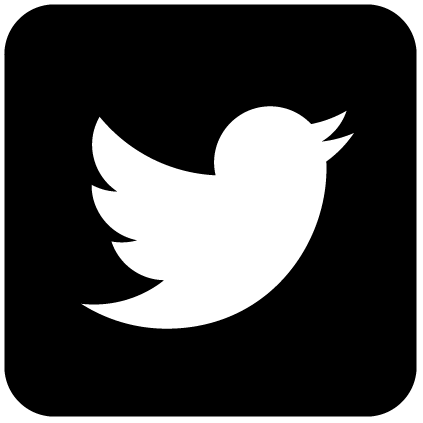 Feel free to pin the image below to save the idea for later! 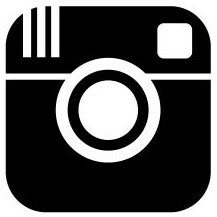 Do u have any pics of it opened as a futon bed?